I posted a version of this in my work blog, and decided I’d like to share it more widely. The postings here on The Red Lines Page are my own and don’t necessarily represent IBM’s positions, strategies or opinions. It’s the early 1990s. We’re three friends, early in our careers, unmarried, in our mid-twenties. On a Monday morning, we talk about our weekends. I’m dating a technical author. Paul has just returned from the Home Counties, where he’s spent time with his fiancée. Craig explains how he’s been out in Coventry with his partner. Paul’s stories were the common currency of young employees in the office, and colleagues were at ease talking to him. Whereas some people in the office were disdainful or ill-mannered about Craig and his boyfriend. Craig didn’t care — he was an out gay man, and just as happy talking at work about his relationship as he was about programming or project management. But that wasn’t the point. There were other gay men in the office who did not feel comfortable that people might know anything about their private life, and chose not to be out at work. It wasn’t that anyone was openly hostile; just that the business culture in the early Nineties was not so accepting. Simple things like the office rituals of congratulations on an engagement or marriage were something that applied to Paul, and not to Craig. It wasn’t the big things that were discriminatory, but a succession of small things. Today, we’d call them “microaggressions” — brief and commonplace daily verbal, behavioural, or environmental indignities, whether intentional or unintentional, that communicate hostile, derogatory, or negative slights and insults. More than 20 years later, society and the law have changed. 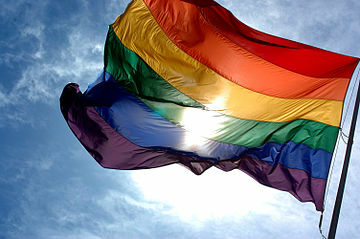 Marriage equality and workplace legislation have both reflected and changed attitudes. The company where I work, IBM, continues to be in Stonewall’s Top Global Employers. We have an internal community for employees who are lesbian, gay, bisexual or transgender, or who have family, friends or colleagues who are L, G, B or T.
And I am proud to say that two members of my organisation are the LGBT Location Champions for the major site where I work. June is recognised around the world as LGBT Pride Month — and IBM is a keen participant. Everyday business activities, such as hiring, training, compensation, promotions, social and recreational activities, should be conducted without discrimination based on race, colour, religion, gender, gender identity or expression, sexual orientation, national origin, disability or age. What about that technical author? Reader, I married her. Now, although I met my wife through IBM, there is very little overlap today between my work and my home life. Despite blogging this, I’m usually fairly private, but that’s my choice — there’s nothing about my work environment that would make me uncomfortable being open about my non-work life. If I wish, I can talk about my family, and I have photos of them in my office. Whereas LGBT employees may still be uncomfortable being out at work. They may feel unwilling to personalise their work place, or spend energy being ambiguous in conversation about “my partner” and what “they” are doing. It’s important that we can all be our whole selves at work. So it’s not enough for a company just to say it has a policy, or that it follows the law. We all have a part to play in challenging those “microaggressions.” And I’ve personally seen how effective that is when individuals at work do that for my friends and colleagues who are gay, lesbian, bisexual, or transgender. If you’re not LGBT, you can be a Straight Ally and have a transformative effect on the workplace experience of your colleagues, both gay and straight. Every LGBT person will make a personal and conscious decision about whether they will be open about their sexual orientation at work. And it’s not simply a case of coming out once. Gay people have to decide whether, and how, they come out every time they meet new colleagues, clients, suppliers or stakeholders. That decision is made easier, however, if they believe their managers and colleagues will support them. 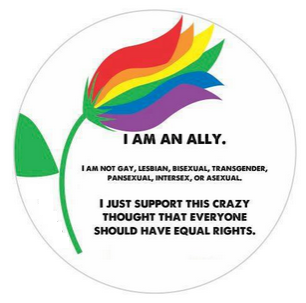 You can find a super guide here about coming out as a Straight Ally. And there’s an interesting workplace guide from Stonewall that I’ve referred to when writing this blog. I’ll quote some more of it in the comments below. So here I am, coming out as a Straight Ally. And not just for June. I expect I’ll need to come out again in the future when I meet new colleagues, clients, suppliers, and stakeholders. I hope you will, too. Every lesbian, gay or bisexual person has to make a conscious decision about whether they will be open about their sexual orientation at work. However, it’s not simply a case of coming out once. Gay people have to decide to come out every time they meet new colleagues, clients, suppliers or stakeholders. In some instances gay people who have come out at work have been ostracised or harassed by their colleagues. Bullying and harassment of lesbian, gay and bisexual colleagues is still common, with one in seven heterosexuals in the national workforce saying they’ve witnessed homophobic bullying of colleagues at work (Living Together, 2007). Lesbian, gay and bisexual people who do not feel able to be out at work often expend significant amounts of energy on avoiding being outed, energy that could be spent on performing more effectively in their job. Many feel they need to avoid forming close relationships with colleagues, avoiding anything that may reveal aspects of their personal life at work and telling lies about their life simply to avoid being outed. This can have an obvious effect on performance. They feel less confident, less motivated, unable to put everything into their job and unable to use their personal experiences to develop creative solutions at work. Not being able to engage with others honestly about who they are has an effect on their relationships with colleagues, managers, clients and stakeholders. They can often be seen as untrustworthy, unfriendly or an unwilling ‘team player’. The decision to come out is made easier however if gay people believe their managers, colleagues and clients will support them. This can be clearly demonstrated by colleagues making a visible effort to make the workplace more gay-friendly. Straight people have a critical role to play in creating gay-friendly workplaces. Stonewall Top 100 employers routinely tell us that ‘straight allies’ have been key to advancing fair treatment of their lesbian, gay and bisexual staff. Their involvement – often precisely because they’re not gay themselves – can have a transformative effect on the culture of an organisation and the workplace experience of staff, both gay and straight.